Giorgio Armani believes that a scent should be unique to each person. When looking to express the essence of his haute couture in a collection of bespoke perfumes, he drew upon the treasured moments in his life, finding inspiration in familiar and beloved scenes, and scents. Armani is obsessed with the pursuit of perfection and precision. His fashion design is defined by elegance and essential silhouettes, and the use of precious and refined materials. It is only natural therefore, that the same can be said for the materials chosen for the Armani Privé collection of perfumes. When creating a fragrance for the collection, he employs 12 to 25 accords – drawn from only the purest ingredients. 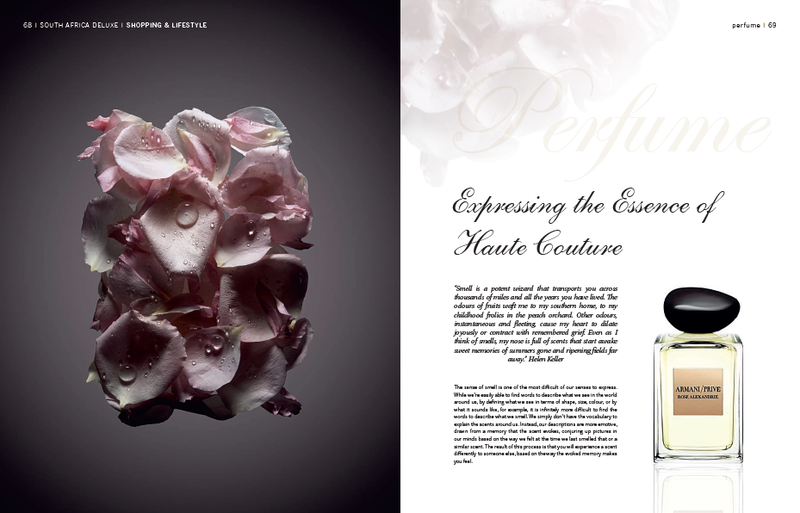 Just as he strives for perfect design, where functionality and beauty work together in harmony in his haute couture lines, he is careful to select different fragrance notes that also blend together harmoniously to create a new unified scent that smells quite different from the individual notes that were originally combined . While many designer fragrances can consist of 80 to 150 accords, Armani’s limited use of accords to create an Armani Privé fragrance bears testimony to the fact that, as with his haute couture lines, only the highest quality, natural materials are used in his collections.